Discover the monumental Arco da Porta Nova in Braga. The Arco da Porta Nova is located west of the old town of Braga, in northern Portugal. 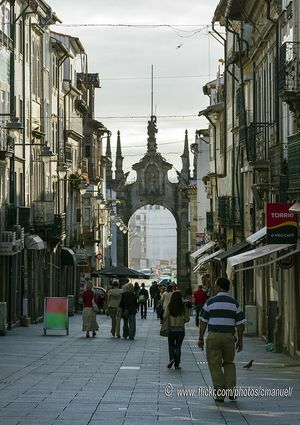 This elegant arch of 18th century is the main entrance to the city of Braga. The arch shows the shield of Archbishop José de Bragança. If you go to the city of Braga, you can not miss the old town. It is necessary to pass through this story arc to go there. Next to this monumental arch is minimalist tower which has the Image Museum. You can see international photographic exhibitions for free in it.